What happens when you combine live action with film and animation? Theatre company 1927 give the answer with an overwhelmingly inventive, charming and thought-provoking spectacle: Golem. This might not be news, as the show premiered last December at The Young Vic to gobs of positive press. But if you missed it: now's your chance to see it in its new West End home, Trafalgar Studios. Drawing on the myth of The Golem — the story of a man who fashions a creature out of clay to work for him — director Suzanne Andrade prods the audience at first subtlely, and then in the face, with questions like "Who are you?" and "Do we control animation (i.e. technology) or does it control us?". It's all very relevant, even frightening, given the digital boom that now sees over 90% of the general public reliant on at least one portable device. Perhaps more surprising is how director Fritz Lang so accurately pondered this in his 1927 film Metropolis (a form of inspiration for the production), or how George Orwell foresaw something similar in his 1940s classics 1984 and the allegorical Animal Farm. Kudos to this multi-media production; we are drawn back into a time when life was simple, and then returned to a dystopia where the world zings and tings with new-this and new-that. "What's really important?" the show asks (in a Fringe-kinda way). The stop-animation is ingenious, marvellously in synch with the cast's comedic timing; a live soundtrack of percussion and piano further attune its quirky essence and Paul Barritt's production design superbly transitions, with literally the blink of an eye, from Orwell 1984 territory to quaint locales such as the after-work absinthe haunt. Keep your eye out for further unique offerings from the stage group — reimagining a Stravinsky ballet and a Ravel opera, plus a new opera with Richard Ayres, are in the cards. 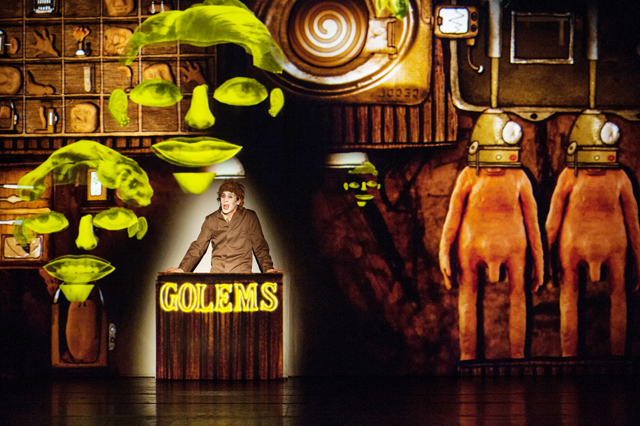 Golem is at Trafalgar Studios, Whitehall, until 22 May. Tickets £10-£60. Londonist saw this on a complimentary ticket.